The Wild West in the 1860s. And it was getting pretty wild in Confusion, the brand new town that sprouted up real quick when some promising gold mines were discovered nearby and everybody wanted a piece of the action. Confusion was somewhere between Ely, Nevada and Delta, Utah. 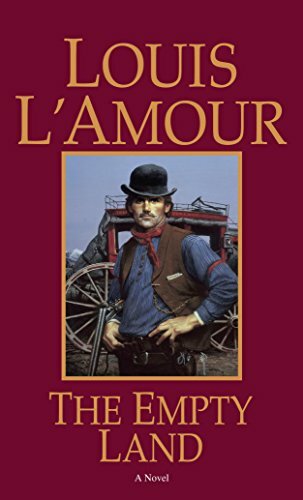 Still open country today, long after L’Amour (1908-1988) wrote The Empty Land in 1969. What would they name the new boomtown? Confusion. Every night fistfights, shootings, tents burned down. Gambling, saloons. Plenty of rough men among a few good ones. Who could enforce some law in a place like this? Before long, Big Thompson, a rough and tumble claim jumper, killed the town’s first marshal. Thompson wanted a share of the big gold mine owned by the founders of Confusion at a budget price but was refused. Hick Sutton was hired as the new marshal. He and his boys were expected to kick Big Thompson out of town. But Sutton’s agenda was shaking down the gamblers, not enforcing the law and ridding the town of the crooks. But he was no match for Thompson who ran him out of town. Some of the miners wanted Matt Coburn, the best gunfighter around, as the new marshal but Felton, one of the founders, was against it. Meanwhile, as the town grew, violence and lawlessness increased. And the bad guys—Big Thompson, the knifeman Peggoty Gorman, and the cold, calculating Harry Meadows--weren’t planning on leaving all that gold nearby. By the 15th day of the life of Confusion, 7 were killed, along with 9 robberies and 2 stagecoach holdups. Felton was finally persuaded to accept Coburn as marshal. Coburn was a gunfighter with a conscience, not a hired lawbreaker like so many others. “I never hired my gun to anybody but the law,” he said to another gunman who challenged his ethics. But he had no interest in the job of town marshal. The Wells Fargo man had a $50,000 shipment of gold bullion to deliver to Carson City by stagecoach. He wanted Coburn to ride shotgun. Coburn was initially reluctant to get involved with Confusion. He didn’t want the marshal job, or the stagecoach gig, either. But he relented, wanting to ride with driver Dandy Burke, who had a reputation as a fighter of stage robbers. The coach journeyed from Confusion to Carson City. Everybody knew what was on board as it had been advertised in the local paper. Gold. But the ad also mentioned casually that Matt Coburn would be riding shotgun. The gold was an enticing target for outlaws, but the smart ones wanted no part of Coburn. Big money meant big risks, and Harry Meadows wasn't reckless. A clueless young gun wanted to join Meadows and attack the stagecoach. Meadows was reluctant, as he considered Coburn too tough and not worth the trouble. But he convinces the impressionable young gun eager to prove himself that he's the man to take down Coburn and earn himself a reputation. Laurie Shannon is a ranch owner. Madge Healy is a former child entertainer who went from town to town entertaining the miners, dancing and singing songs from their youths. Will Matt Coburn survive the attempts on his life by Meadows and Big Thompson? And if he does survive, which of the two women--Shannon or Healy--will he choose? And what about Confusion and its three founding miners? Will the town survive or be destroyed like so many others by the rowdy, reckless bad guys who move from town to town with little care for the havoc they wreak? Before The Empty Land, it had been years since I had picked up a Western, but I’m glad I did. I couldn’t put this one down. L’Amour knew the West, and he spins a great yarn. The first thing I did after finishing the last page was look to see what other of his novels I might buy. That’s the mark of a great storyteller. My Amazon Book Review Page is HERE. My Amazon AUTHOR Page is HERE.